Our main goal at Follow is to make easy for you to monitor your online competition. We provide you with an online dashboard, and browser toolbar through which you can get access to different information regarding several verticals such as traffic, demographics, display advertising, and more. Naturally, the great amount of information we provide can sometimes be overwhelming and difficult to manage. 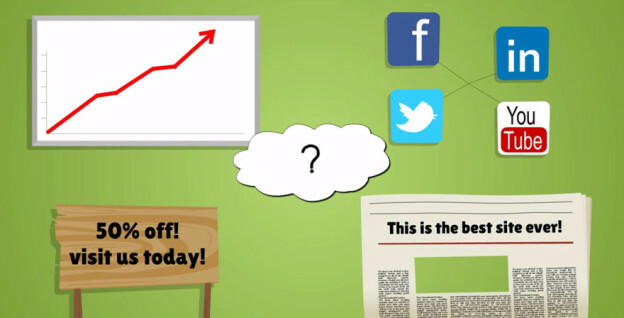 That is why we engineered Follow so that you may share the same portfolio of websites that you follow with team members. One of the biggest advantages of this is that you don’t need to have all members of your team as paid account holders. Even if just one person has a paid membership with Follow, this person can invite as many team members as possible. These work colleagues will get access to the same amount of information that the paid account owner has, but only on that person’s account. In their own portfolio, however, the free team members will only get access to a limited amount of data. Thus, this means that not everybody in your company has to be a paying account holder to have all the data that Follow can provide, and all the features and benefits. This is another interesting feature we developed. Thus, this is the way you can have your team started on Follow. As mentioned earlier, Follow provides you with the ability to create portfolios of websites. These portfolios are also sharable, so that you, as the administrator, can invite team members to see the same statistics you get access to. 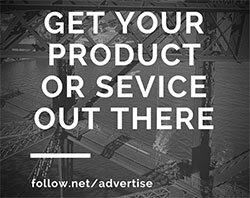 This way, if you follow the same project with work colleagues — be it around SEO, SEM, or display advertising for instance — you can work with other people. When you first start Follow, you are going to have your own portfolio, but you can of course create more. To create a portfolio simply head over to Follow.net, and open the web-based platform. Click on the top-left corner, as shown below, and a pop-up window will appear (see image further down). You will see a list of portfolios created previously. Click on the top-left corner within Follow’s web-based platform, and a pop-up will appear (below). As shown by the image below, you can create a portfolio, and call it whatever you want. For the sake of this example, we will create a portfolio called SEO (Search Engine Optimization). After clicking, a pop-up window will appear. Click on Create New Portfolio. The pop-up above shows a list of portfolios that are already on your account. Click on Create New Portfolio to create a new one. Let’s add a new portfolio called SEO. As you can see from below, you only need to type SEO, and then click on Create. The new SEO portfolio is now created. It has the right name, but it’s still empty. As you can see from the image above, the new portfolio called SEO is created, and it’s sitting at the bottom of the list. Now that you have created the new portfolio, it is time to add websites you would like to follow. Follow prompts you to add new sites to the SEO portfolio. Keep in mind that Follow, by default, does not allow you to create a portfolio and leave it empty. As you can see from below, you can add one site after another. To add a site just click on the + Add Site button. If you make a mistake, or you decide a site should not be added to this portfolio, just press the red minus (-) sign. After you have added all the sites you want, just press on Follow Sites. Adding a few SEO agency websites to the newly created SEO portfolio. As visible from below, the SEO portfolio is now created within Follow. In our SEO portfolio we now have four websites. We can, of course, add more, but let’s stick with those four for now. This is a portfolio easy to manage. However, when you have portfolios with hundreds of sites — as some of our customers do — you want to make order. One smart way to do that is using tags, which are like keywords. Let’s order the websites in our portfolio with geographical tags. MOZ is a U.S. agency, Searchmetrics is based in Germany, colobri.io is from Poland, and Web Ceo is from the UK. Type the tags you want, and click Create. Click Create New Tag to add more. In the video below we added the tags US, Germany, Poland, and UK. Close the pop-up (just click anywhere outside it). Click on any site you’d like to be associated with a new tag, and click on the tag icon (top-right corner), as shown below. Under Tagged Domains you will now see your tagged websites. A short, looping video explaining the steps to add tags to a portfolio in Follow. Click on Invite New Member. Type the email address of the person you would like to invite. This quick video below shows what to do exactly. A short, looping video showing how to invite team members to a portfolio in Follow. When you click on Send Invite, Follow will automatically send the invitation to the email address you entered. The person invited does not need to be already on Follow to accept and get access to the portfolio, but will need to create a new account when clicking on the link included in the email sent by you. This below is how the email invitation looks like. 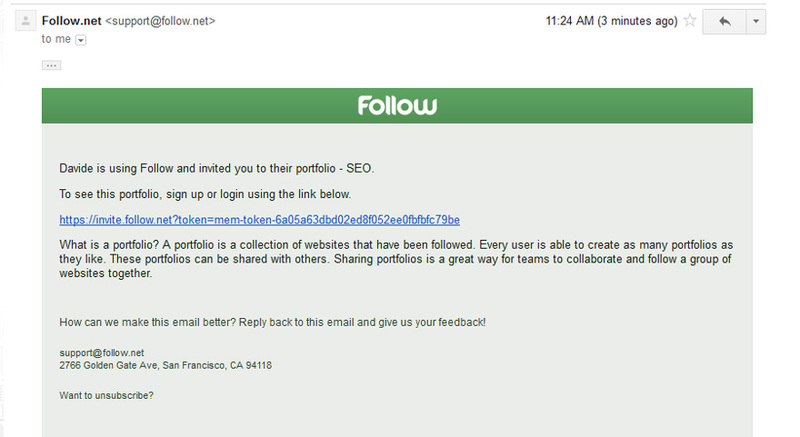 The email notification inviting a team member to share the SEO portfolio in Follow. Once the team member click on the link included in the email notification, this person will have access to the portfolio. When this person joins the portfolio, you will see this information in Follow. Follow allows you to see if the person invited has accepted the invitation or not. You, as the administrator, will be able to manage this new user of course. You can remove the person from the portfolio, and can invite a new one for instance. Now you both have access to the domains in the company portfolio. If any of the users in the SEO portfolio adds new domains to the portfolio, also others will be able to see the new domain that was just added. Follow can be a great tool for individuals, but also for small and large teams. Are you on Follow yet? Our platform allows you to keep an eye on your online competition. Get on Follow today, we also have a free account.